This morning I was working on an article about the different types of target audience for a product of Cultural Tourism, when I reminded the conference that gave Philip Kotler in Barcelona in late 2004 and to which I was lucky enough to attend. In this conference, Philip Kotler told us the 10 principles of the New Marketing and I remember that one of the slides that struck me was just a segmentation of target audience that Kotler showed us an example. Although it has been 4 years since this conference today rereading the summary and seeing what Kotler proposed remains interesting, I decided to publish it again and do it with today's date instead of entering it in the blog earlier date as I have done with other articles'm finding the net and gave up for lost. Kotler is recognized as the world's foremost authority on Marketing and author of the most important works written in the field of Marketing. He has been a consultant for companies such as General Electric, General Motors, IBM, AT & T, Honeywell, Bank of America and Merck. He is the father of modern marketing, the marketing 2.0. This article is the summary of the conference held at the Philip Kotler World Forum Marketing and SalesIn Barcelona in October 2004. Kotler assumes that Marketing as we know it is finished and needs to evolve to something much more in keeping with our time, the immediacy of information and total segmentation, have completely changed our consumption habits. TV ads are becoming less impact on the audience. According to a recent study, the ads have a return of 32 cents for every dollar invested. Also traditional mail communication is increasingly poorer response and further telemarketing. Whereupon, it is increasingly difficult for the launch of a new product to be successful, since the resistance of consumers are reaching extremes that make all the assumptions of traditional marketing have to be revised. According to Kotler, a person in the United States, is subject to between 3,000 and 5,000 advertising impacts the day. With what people are completely saturated. 60% of those interviewed in the study mentioned by Kotler, hates publicity and marketing. 70% of people, change the channel or leave the TV during commercial breaks. 60% of people want advertising in general is limited. 14% of people want the advertising ban. 41% of people would be willing to pay for that TV stations no advertising was aired. 70% would be willing to buy a product to help them eliminate advertising from their screens. The other battlefield is in businessWhat a CFO thinks about Marketing your business? Less than 57% of CFOs believe that investment in marketing your company does, have a positive effect on the growth of it. 27% believe that Marketing is only useful as short-term tactic. 32% admit that in hard times for a company, the first budget to cut is marketing. Information is ubiquitous (is everywhere at the same time) and consumers are well informed about most products on those who are interested, so the sale should be based on dialogue and marketing "connect and collaborate" not a monologue selling and marketing focus on "direct and control" to the consumer. We offer our customers better solutions, most satisfying experiences and the opportunity to have a long-term relationship. Principle # 2: Develop the offer pointing directly only to the objective of that product or service public. "Find a niche, and then make sure there is a market for that niche." Principle # 3: Designing marketing strategies from the point of view of the customer. Once we are clear what segment we went with our product, Kotler recommends that we focus on the value proposition we offer our customers and we design a marketing campaign aimed to communicate this value proposition, not the characteristics of our product it is what is usually done normally. Identify the expectations of our customers or potential customers. To analyze the ability of our organization to those values ​​to our customers. The message we must communicate and sell, is about the value we pass on, not about the features of our product. Make sure we give the value promised and that over time we will improve and expand this model of value. To encourage and guide the listeners, Kotler showed us some examples of sales messages designed to convey the value offered to the user, instead of orienting the product. Product sold: liters of paint to paint cars. Message to convey: we actually painted cars. Product: pet food. Message: health and animal weight gain. Product: diesel engines. Message: power is never interrupted. Product: explosives. Message: rocks made crumbs. Principle # 4: Focus on how to distribute / deliver the product, not the product itself. Kotler proposes to ask ourselves if we can find a way to redefine our distribution network and delivery to provide more value to the user. Some companies have already done, in the case of Dell Ikea online and offline world level. Principle # 5: Seek customer to jointly create more value: the role of the company has changed. With Transactional Marketing (about 1950), the company defined and created value for consumers. With Relationship Marketing (1980 to present), the company focused on attracting, developing and retaining profitable customers. The new Marketing, or Marketing Collaborative (as he calls Kotler) should focus on working with the client so that together, create new and unique ways to create value. It proposes that we establish dialogue with our customers and the communities of consumers of our products. Offering a product line so that the customer can find the one closest to your wishes. For example, 20 different colors for the same item, or 26 different options for hockey sticks (this is a real case). Although Kotler also proposes to let the customer participate in the original design of the products, for example asking for advice based customers while product prototypes are developed. Principle # 6: Use new ways to reach customers with our messages. ... And especially watch a lot with unhappy customers, since Internet permits you to reach many people, and can do much harm if not properly treated. As for our marketing, Kotler special emphasis on the "permition Marketing" (or Marketing with permission) because it is a good way for the customer to indicate whether or not to receive such advertising and needless that trouble those who do not want it. The value we want to convey. Something that fun or at least entertain it. And about new ways to advertise, he stressed the importance of sponsorships, mentions of our products in TV shows or entertainment programs or their appearance at festivals, and above all, the direct promotion on the street. Campaign Vespa through the streets of Los Angeles: Some more or less known models walked for a while through the streets of Los Angeles, with these bikes, visiting the trendy bars and talking to the people who frequented. Ford campaign for the launch of the Ford Focus: Ford identified 120 people in 6 key markets, and let them use for free for 6 months a Focus and promotional material thereof. This same practice often do video game companies with hundreds of teenagers who enjoy free games in exchange for talking about them to their friends. Philip Kotler stressed the importance of having a scorecard that gives us an accurate picture of how they are evolving each of the factors involved in the sales process. Improvements in quality: measure how many improvements have been implemented in our products. Principle # 8: Develop high-tech marketing. At this point, Kotler warned that although high technology is required, it is not to the same degree for all companies. Nor is it only in implementing a CRM or ERP. Creating performance tables: by object and person results. Kotler emphasizes the direction of campaigns, projects and products, especially since it was detected that the main stumbling block in implementing high technology, is the ignorance of the existence of it, by the marketing professionals. Hence the direction of these three sections is key when implementing it. Oriented company benefits: Reduced costs, replacing people with technology, reduces the price and value of the products, get many customers. The company oriented customer loyalty: Investing in marketing assets, empowers employees using technology, seeks to reduce product prices to reward customer inquires how you can give more value to your customer, select customers getting. Principle # 10: Looking at marketing as a whole, to regain influence in your own company. Marketing affects all processes of a company and this is what we convey in our own company. Decisions made in maketing affect customers, members of the company and external collaborators. Together we must define what the market that the company is heading. Together they have to discover what opportunities appearing on the market (Kotler proposes to think it at least 5 opportunities each year), and together they should find out what training and infrastructure will be needed to carry it all out. The intervention of these 3 factors: customers, the company and the network of partners in the marketing of our company, is what will show us that we are on track and we are beginning to apply the rules of the New Marketing. And with this last point, we finished the "summary" of the conference by Philip Kotler in the framework of the World Forum of Marketing and Sales. The truth is that the conference really paid off and that all attendees left her with a huge desire to start applying what they have learned. The downside is that it costs him his power to implement concrete actions explained to the company, but at least Kotler was quite clear and we illustrated with many examples. Last Wednesday, March 18 took place in the 4th Reus. Manageware edition. The Manageware are a business conference organized by the Company & Humanities AssociationTogether with Chamber of Commerce of Reus and the Senior Management Institute, An educational institution Tarragona with great prestige in management training. Overall, the conference is aimed to raise awareness of ICT among senior managers of companies in the area of ​​Tarragona, and has been held for 4 years. Personally, I have the honor to participate in them as a speaker from the first year, so I'm very excited when approaching this time of year and prepare new papers that may be of interest to the audience Manageware. This year the title of my presentation was: Marketing in Times of Crisis - The 5 Digital Marketing techniques with higher ROI. So while preparing the slides I analyzed all the techniques to drive traffic to a web page and select those with the highest ROI. Presence Search Engine: Natural positioning (SEO). In this section I explained how a search engine works and how you can get to appear in the top positions for certain searches. Presence Search Engine: Google Maps appearance (Local Business Center). In this section I explained the importance of appearing in the search results page dedicated to Google Maps. Especially for business where location is important. To others, the cost of appearing on Google Maps is zero, hence the ROI of this action is of the highest. Presence Search Engine: Purchase campaigns KEYWORD (SEM). Here I explained how the sorting algorithm ads Adwords works and therefore how we can improve our position until it appears at the top of the Google results page. Online Public Relations: Presence in blogs and online media. In this chapter I explained how we can manage our presence in blogs and online media, and how we can hire her through online markets bloggers. email Marketing: How to conduct a campaign to external database and how to do an internal database. Here I explained from where to buy data to conduct an email campaign, to how to do it. Also how to make our communications are not considered spam. Review of "HARVEST OF CENTAUR" by Eduardo Gallego and Guillem Sanchez - NOVA Ed B. 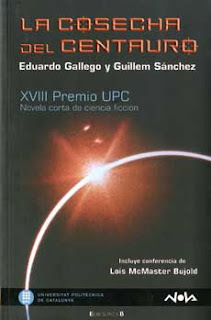 As every year, the Nova Collection Ediciones B publishes the winning book Short Novel prize UPC Science Fiction. This year's winning book is "Harvest Centauri"Eduardo Gallego and Guillem Sanchez. Like all books NOVA Collection, the book includes a presentation of Miquel Barceló (without detracting from the content of the books, the presentation of Miquel Barceló is one of the best things about this collection). In this book also it gave the conference included Lois McMaster Bujold in the ceremony of the UPC awards. Still, I've missed you too advertize any of the finalists and the winning play section UPC students ... are usually interesting and different works, and in previous editions published them in the same book by the winning work ... What will the crisis? La trama transcurre en un futuro lejano en el que nuestra galaxia está colonizada por humanos, pero por dos grupos separados que habían perdido contacto entre sí. Los de un brazo están más desarrollados en ingeniería y disponen de buenas naves espaciales, larga vida y androides de combate (con sentimientos) y que físicamente son indistinguibles de los humanos. En el otro brazo de la galaxia es la biología la ciencia que se ha desarrollado más, y sus habitantes son capaces de crear edificios a partir del desarrollo natural de árboles y plantas, son pacíficos y sociables, y aun a pesar de ser capaces de colonizar planetas de distintos sistemas, no disponen de naves que rivalicen con las de los humanos del otro brazo. Only by developing the "first encounter" and the subsequent relationship between the two groups of settlers of the two arms, the book and promised to be interesting, but the authors have not been satisfied with this and have included in the plot to a powerful alien species it is dedicated to plant life different planets, and then returns to "pick up" their harvest. Following this argument, some of the remaining planets to collect, are located in the human site arm which has developed more biology, and the imminent danger that leads to the appearance of these aliens causes the representatives of the two companies human unite to collaborate and solve the mystery of harvested planets. As this is a short novel, the book is read in a couple of days and leaves you wanting to know more about human colonies and the interaction between them. About the Authors: Eduardo Gallego is a biologist and professor of mycology at the University of Almería. Guillem Sánchez He is an economist and military history buff. Together they make a good tandem. I had not read anything about them so far, even though Miquel Barceló indicates in his preface that both are known in the world of Science Fiction Spanish, so we'll look to amend my mistake and read more books by these authors. In short, a book 100% recommended, which leaves a good taste and makes for a fun weekend. https://www.montsepenarroya.com/wp-content/uploads/2017/09/MP-Logo-Web-1.png 0 0 Peñarroya Montserrat https://www.montsepenarroya.com/wp-content/uploads/2017/09/MP-Logo-Web-1.png Peñarroya Montserrat2009-03-22 23:27:152010-08-07 18:41:18Review of "HARVEST OF CENTAUR" by Eduardo Gallego and Guillem Sanchez - NOVA Ed B. Unlike the books I've been writing reviews, Atlantis: A short history of a Platonic myth It is not a book of science fiction. This is an essay written by Pierre Vidal-Naquet walking and analyzes the emergence of the myth of Atlantis in the Western world literature. The book begins with Plato in 355 B.C. when Atlantis appointment and described both his work Timeo like in Critias. The author comes to our present time, via Rome, the Renaissance, for the works of Jules Verne, and even our Mn. Cinto Verdaguer which speaks of Atlantis in his eponymous poem. Among other issues, also it analyzes how the Hitler era Germans take over the item and include it in their mythology, becoming the Aryan race, the race of the descendants of the Atlanteans. From this premise part of the argument of many science fiction books I've been chronicling in this blog. After analyzing all available information about Atlantis, the opinion of Pierre Vidal-Naquet is that the myth of Atlantis was literally "invented" by Plato as a metaphor to illustrate an imaginary and utopian Athens, and that eventually the myth and history are mixed giving rise to numerous speculations about the origin of this lost continent, the descendants of the Atlanteans and the evolution of language and the Atlantean culture. In the book, the author uses to include many interesting antique prints with maps of possible sites of Atlantis that have been published over the last 2000 years. In general, a scholarly book, with lots of footnotes page (sometimes the note occupies almost the entire page) but we read with little effort to the minimum that a certain interest in the subject is taken. 100% recommended if you want to know more about Atlantis. 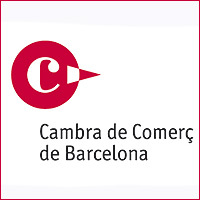 Today has been presented in Manlleu, the headquarters of Barcelona Chamber of Commerce held in this city, the Digital Marketing Guide published by this camera and PIMESTIC. Part of the presentation consisted of a mine paper entitled "9 Techniques to attract visitors to a Website". In this talk I explain 9 ways to attract traffic to a website. The presentation was a success, the room was full, companies have asked questions and out, people have been enough to talk to me and to inquire about PIMESTIC aid for companies. As always, I have perhaps entertaining too in search engine optimization, but since it is the cheapest technique number 1, the most effective and, I think it's worth explaining a little more than time allows me ... not today it has been an exception. Also explaining how optimizing an SEM campaign I think I've become too long ... but again, people asked and asked for more. How can I refuse? Total, instead of one hour, my presentation lasted 2 hours ... but no one has complained, nor has gone before completion, so I think they have found useful and immediately applicable in their business. Free search engine optimization course: Search Engine Optimization Course. Video and presentation identical to today, where you can hear the talk and follow the slides (corresponding to this same talk, but issued on February 20 in Barcelona): Video presentation of Digital Marketing. URL where you can download the Digital Marketing Guide PIMESTIC and the camera: Digital Marketing Guide. URL where you can download from Electronic Commerce Guide (Which becomes the talk, but with 23 Digital Marketing techniques instead of the 9 first): Electronic Commerce Guide. URL with all Guides Barcelona Chamber of Commerce: Enterprise guides. Next: Penedes Vilafranca on 31 March at 9h30 ', at the headquarters of the Barcelona Chamber of Commerce in this city. Last week I had a "experiencia revival"Related to one of my favorite hobbies in what is Science Fiction: the universe Star Trek. He was quietly reading the tweets of the people I follow, when I found a few twits published by Sean Donahoe they were clavaditos to Rules of Acquisition de los Ferengi: If "profit"Here ... that if"profit"There ... until I took the liberty to contact him and ask him if he had ever read the Rules of Acquisition. I said yes but had not realized that his advice seemed both to these rules. The Ferengi (or Ferenghi) are a humanoid species originating from the planet Fenginar that physically are characterized by their large ears, punteagudos teeth and prominent frontal lobes. A sociocultural level, the Ferengi are a very interesting species that maintains a culture based on trade and follow a code of conduct called "Rules of Acquisition"(Sorry, I could not translate giving the meaning in English). At first viewing Star Trek (This loooong time ago) each time a Ferengi cited a rule, pointing me in a book ... Some of them are excellent and very helpful in doing business. Others are not so applicable, but at least get you to smile. – Good customers are as rare as latinum, treasure them. – The bigger the smile, the sharper the knife. – Every once in a while declare peace. It confuses the hell out of your enemies. – Ask not what your profits can do for you, ask what you can do for your profits. In total there are 280 rules. Divertísimas all ... and some, like those mentioned above, very useful in real life. After reading the penultimate sequel Ender's GameI promised myself not to read anything more than Orson Scott Card. When from Nova published the latest sequel, I did not buy it, even though I bought all the books published this collection. Not that I have anything against Orson Scott Card (I met him in Mataro Hispacon in 97 and I've read almost everything published his Nova de Ediciones B). But he was sick of sequels to Ender and books aimed at an increasingly young audience and without any grace or orientation toward science fiction. As indicated the same as OSC and makes Miquel Barceló in his foreword, the book was written by Aaron Johnston from a story published in Analog CSO in 1976. So although the characters are typical of CSOs, the rest of the book it is not. Make no mistake, the book is written by Aaron Joshnston not by CSOs. Although CSO hand can be seen in the plot and setting. The plot tells the story of several characters and mysterious "healers" who are biologically enhanced. These healers have a virus that adapts to individual genetics for which has been created, and allow any genetic disease cure the person to whom he inoculated. So in theory, they have the cure for many diseases until today mortals. The bad thing about this virus is that for a few days, is deadly to other humans who are close to the sick, which makes it extremely dangerous. And the bad thing is that the curators believe in a new religious cult invented by its leader, promising them "happy world"And above all healthier. We must acknowledge that even though there is a clear protagonist, all characters are treated in depth and acquire the dimension that gets to empathize with some and hate others. This is something that CSOs often do well in their books and this has certainly veiled it so well. Overall, the book is well written, can be read well, engages, has pace and ultimately, a book that makes you think it is. So my verdict is a book by Orson Scott Card and Aaron is Joshnston, is that it is 100% recommended.